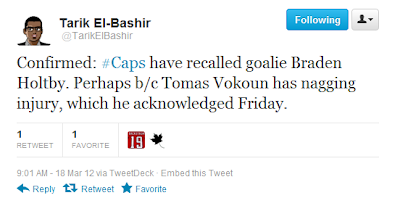 Vokoun played on Friday in the loss to the Jets and gave up 3 goals. It seems like Dale Hunter wants to go with Vokoun as his main goaltender but Vokoun may be too injured to make that happen. Going into the playoffs (if they make it) is not good with a hurt goalie.